Organisations hiring aviation services don’t only need to know that the service that they hiring is safe. Every company wants to know that they are getting value for money and delivering the best level of safety they can for their personnel being transported by air. The same applies for helicopter operations moving sling loads or personnel. Argus Consulting Group has developed a benchmarking tool for showing how operators are ranked in the industry against the industry average and best practice. This is used by many organisations as a safety indicator. Argus, over a number of years has developed a bank of statements that apply to safe aviation operations. Our safety reviewers use questions and investigations to develop a complet report that gives an excellent indication of the safety culture and organisational resilience of the company in question. When Argus Consulting Group conducts an aviation safety review, you as the client receive the report which, in the executive summary shows, exactly where the reviewed company ranks in terms of the industry average and best practice. 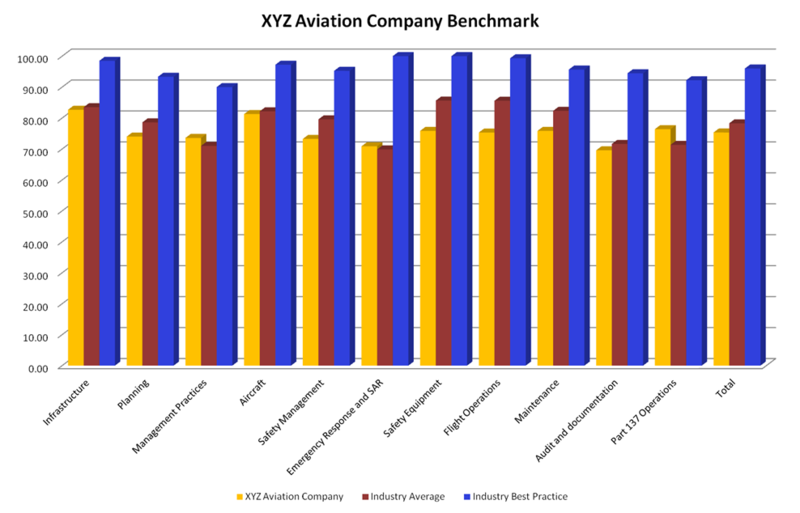 In the example below, the maroon bars show the score of the sample company against the yellow bars which is the industry average and the blue bars which are the industry best practice. This systems approach is recognised as providing information that is pertinent to the standing off an aviation organisation. If you are making decisions about aviation safety, can you really afford not to have this information? On the reactive side, we carry out accident investigation. We have a number of accident investigators who have extensive experience both in Australia and internationally. With an emphasis on specialist aviation services, Argus is well familiar with the accident aetiology associated with our key services areas.